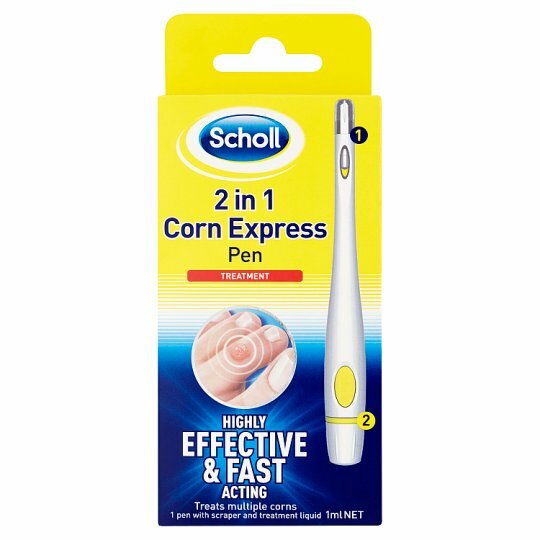 The new Scholl 2 in 1 Corn Express Pen is a unique, highly effective and fast acting way to teat corns. It is reusable and will treat multiple corns. Visible improvement within 5 days. Corns are amongst the most common problems to affect the feet. Corns are a thickening of the skin in response to pressure. The thickened skin forms in a small inverted cone-shape (called a nucleus) that presses into the skin. 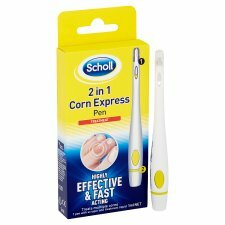 Scholl 2 in 1 Corn Express is suitable for hard corns on the top of the toes and on the balls of the feet and for soft corns between the toes. Not recommended for use if you corn bleeds or hurts excessively. Seek medical advice as required. Corns are shaped like an inverted cone with the interior "point" often pressing on nerve endings, which may cause pain and discomfort, making it uncomfortable to walk. There is often an area of callus/hard skin overlying the corn. Store in dry environment and below 25°C away from direct sunlight. 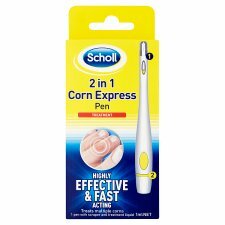 How do I use Scholl 2 in 1 Corn Express Pen? Gently exfoliate the top layers of the corn to reduce the painful rubbing, providing relief and allowing the advanced liquid to penetrate into the corn. Reuse every 3 days to help remove the corn. Apply the advanced liquid using the targeted applicator to soften the corn for an effective treatment. Advice Do not use on broken irritated skin. Immediately discontinue use if any discomfort or irritation occurs and seek medical advice. For external use only. Only use on the affected area, do not apply to healthy skin. KEEP OUT OF REACH OF CHILDREN. Avoid use if pregnant or breast feeding. Avoid contact with eyes. Do not use any other products on the affected area during the treatment period. Flammable, keep away from sources of ignition. Use only as directed. Scholl and diabetes This product is NOT SUITABLE for diabetics or those with poor blood circulation. For more information see leaflet inside.